There are some amazing things that just rock your world. And for me, this is one of them. While I haven't been able to use them (they aren't available in Australia), I think it is so amazing I wanted to share it with you. 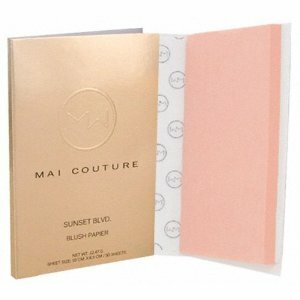 Mai Couture Blush Papier is a sheet of paper that you rub onto your cheeks and blush transfers onto it. These would be amazing if you were travelling, since you don't need to have a blush brush! They have 3 colors and they are US$17.50 for 50 sheets in a booklet. You can find out more about them here. So all of my US readers try them out!!! Are you as in love with them as I am? Also, how cute is Macbarbie07. Her videos always make me smile. Wow! That's so clever, I'd love to try them out!! HI Ladies! You can purchase these from Beauty Works West in Australia!! Babe, thanks for this post, I have just added it to my wish list! Did you get around to purchasing? I would love to know if it's worth the effort? I haven't ordered them yet. It costs so much to order them once you factor in shipping. I'm planning on doing my first US order (using a forwarding service) but it won't happen till about March/April once I go back to work and have extra money. I want to get these and their bronzer papier, Urban decay naked palatte, a brush set from Laura Mercier and some too faced products. Why don't you order from the Aussie company? I was so tempted to order some the other night! And like you, I want the wallet and the bronzer paper!